The "View New Content" link in the upper right corner of the screen is an example of a stream of our content. You can customize your own streams, and even replace the View New Content link with a different stream. 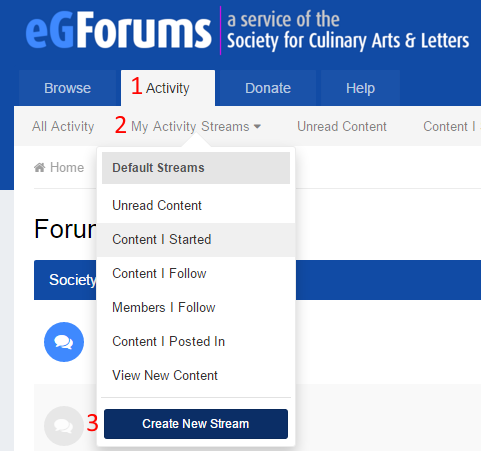 A stream can be customized to show just certain forums, certain tags, certain types of content, among other options. To begin, mouse over the Activity tab (1) and click My Activity Streams (2). At the bottom of the menu click on "Create New Stream" (3). The New Stream dialog will load. First, give your new stream a title (1). Next, choose the options for the stream. The "Show Me" section (2) allows you to decide whether you only want to see Content Items like forums topics, or whether you want to see each individual action in those items (every post, in other words). Normally you will want to choose Content Items only for that option. You can also narrow by Content type (3). If you choose Topics, you will also be able to choose a specific set of forums to display content from by clicking the gear that appears to the right of Topics when it is selected. If you would like to see only content with specific tags, you can enter them at (4). 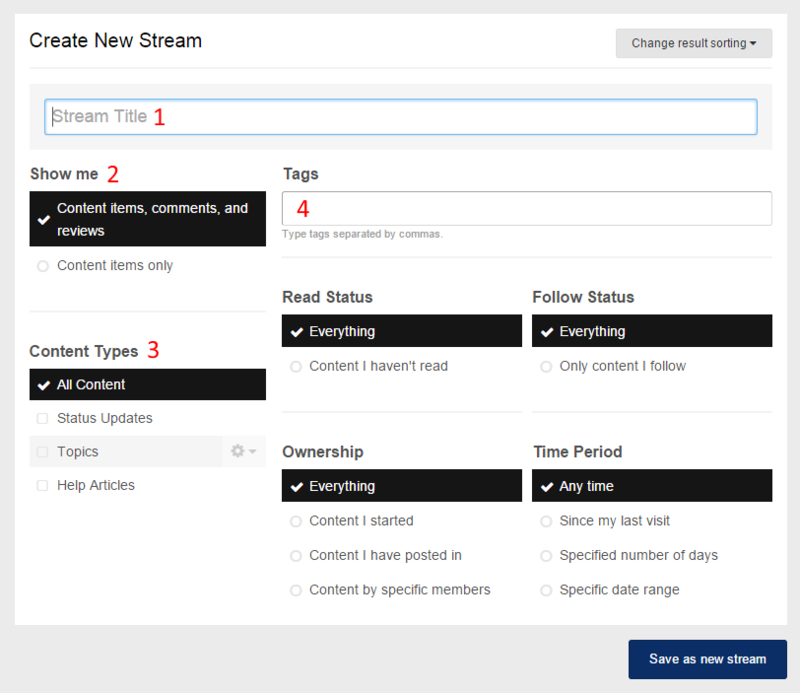 Finally, you can choose the Read Status, Follow Status, Ownership, and Time Period for your stream. When you are done click "Save as new stream" in the lower right corner.